Don’t go looking for the Quarry Hill flats now. They went from showpiece to shame in their brief forty year lifespan, from shown off to shut down. By the time they were demolished in 1978, the flats had become a byword for the failure – some would say the inhumanity – of municipalism’s more grandiose attempts to rehouse working people. But I hope I’ll challenge at least some some of that received wisdom in this piece. That the Leeds working class needed rehousing was in no doubt. Leeds, then the fifth largest city in England, possessed 78,000 back-to-backs in 1914. 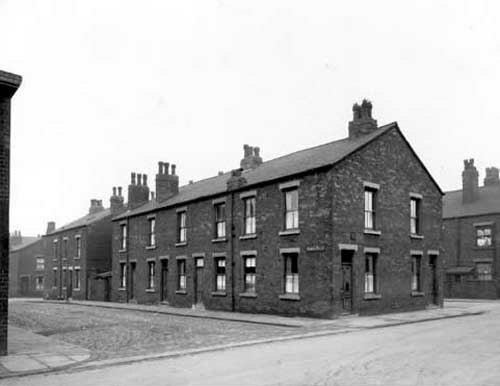 And while back-to-back housing had been outlawed by national legislation in 1909, a technicality – that plans for further back-to-back housing were already in place – allowed new back-to-backs to be built in Leeds into the 1930s. Little had been done to tackle the problem in the 1920s and a 1932 Council report concluded 33,500 houses should be demolished. The inaction of the Conservative majority infuriated the Labour opposition and, in particular, its most vociferous member, the Reverend Charles Jenkinson, vicar of Holbeck and, since 1930, its Labour ward councillor too. 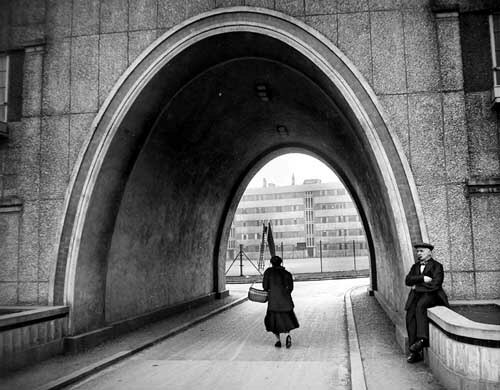 Labour produced a minority report which called for the clearance of 16,000 houses by 1938 and a further 30,000 by 1948. Labour’s radicalism secured it victory in the local elections of November 1933. Jenkinson became chair of housing and proposed the clearance of 3000 houses in the first year, 5000 in the second and 5500 in each of the following four. 30,000 new homes were to be constructed – at a cost of £12 million. But the need to rehouse the slum population was pressing. Multi-storey flats seemed an inescapable solution. Furthermore, the redevelopment of Quarry Hill – an area containing some of the worst housing in Leeds less than one mile from the city centre – tackled some of the particular problems which bedevilled the garden suburbs: their distance from the city centre and local employment, the high transportation costs that followed and, more intangibly, a loss of community that ensued. 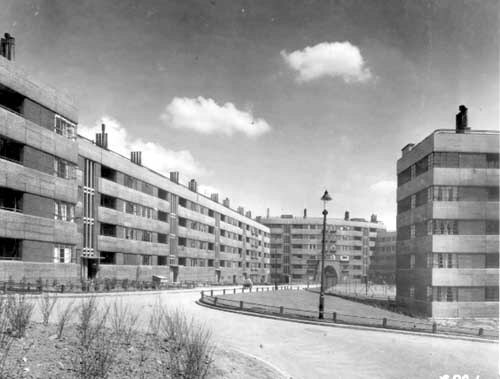 The Director of Housing, RAH Livett, appointed by the incoming Labour administration in 1934, had pioneered a smaller flatted scheme in Manchester and was a strong advocate of flats. Together, Jenkinson and Livett determined to create something special – and they did so. 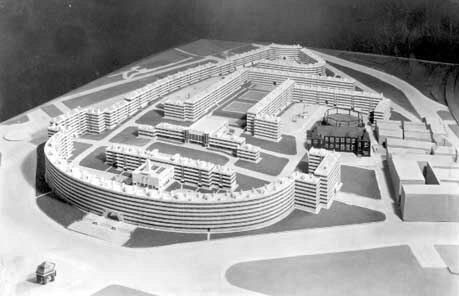 Quarry Hill was the one interwar scheme which came close to matching the scale and ambition of the workers’ housing in Vienna that excited so many contemporary modernists and enthused local councillors who were eager for housing solutions which matched the scale of housing problems. A delegation from Leeds had visited Vienna in 1932 and been much impressed by the Karl Marx-Hof, Red Vienna’s showpiece. It – and similar Continental projects – seemed to offer scale, economy and community: class consciousness with convenience to some; to others, simply modern housing that dignified working-class lives. The Quarry Hill scheme contained 938 flats, housing around 3000 people, in seven and eight-story blocks set in 36 acres of inner-city land. It would also include a community hall, seating 520, with stage and dressing rooms, twenty shops, indoor and outdoor swimming pools and a wading pool, extensive courtyards, gardens and play areas, a nursery and communal laundry – even a mortuary. Another innovation lay in the arrangements for waste disposal. The Garchey system, taken from France, saw domestic refuse placed in a container under the sink and flushed by waste water to a central incinerator which, it was originally planned, would heat the swimming pools. 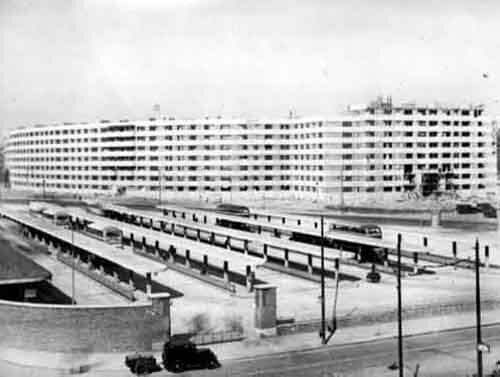 Finally, the flats were pioneering in their prefabricated method of construction. In a further borrowing from France, they were built using the Mopin system using a light steel frame and pre-cast concrete units manufactured on site. This eliminated the need for brickwork and plastering and would, it was thought, bring big savings in the costs of materials and skilled labour. Building began in 1934 and the first tenants moved in in 1938. But forty years later the entire development was bulldozed. What went wrong? Well, the Mopin system was a failure. Production line jams and a shortage of the sort of skills the system did require meant production overruns and much higher costs than anticipated. 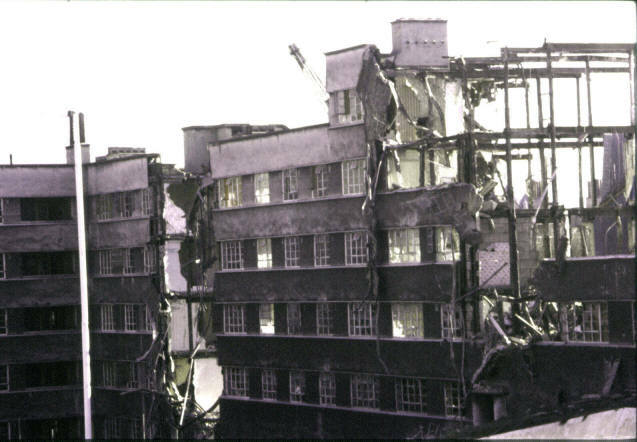 Building dragged on to 1941 and, in the long term, structural defects – corrosion in the steelwork, concrete slabs working loose – necessitated costly on-going repairs. The waste disposal system was also riddled with problems – blockages, leaks and smells. This was all particularly problematic as savings in construction costs were vital to finance the social facilities held vital to the scheme’s overall success. (Normal housing subsidies would cover only basic building costs.) The concert hall was never built and many of the other planned amenities – the swimming pools, tennis courts and nursery, for example – failed to materialise. Few shops opened. What emerged was a pale shadow of the original dream. Even the window boxes were sabotaged by the harsh Yorkshire climate. Later planning mistakes did not help. Quarry Hill became a classic example of an ‘island estate’, geographically cut off and socially isolated. Encircling main roads and the perimeter blocks – ‘somewhat forbidding though undeniably impressive’ according to Pevsner – created a fortress-like appearance which intimidated non-residents. I remember warmth and neighbourliness, not isolation. The shops had one of the best fish and chip shops in Leeds. We had a washhouse second to none but most of all the comradeship between neighbours, fantastic. 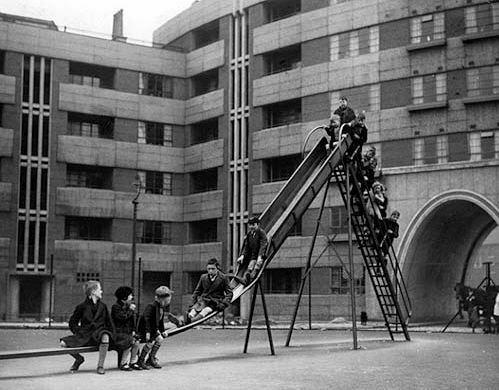 Quarry Hill Flats was a way of life, a community. They didn’t get it wrong – well not for me anyway! Quarry Hill Flats – I loved them and still do!!! And that, of course, sounds like a golden past viewed through rose-tinted spectacles. But the testimony is overwhelming and is backed up by the historical record of a tenants’ association second to none in its energy with two thirds of the residents members at peak. For all the failures, something worked here. People were moved from the slums and rehoused in better conditions than they had ever known or could ever have expected. A close-knit community developed which took pride in its environs whilst fully conscious – and actively critical – of its shortfalls. The Council took the decision to demolish the estate in 1973. A couple of decades later the estate would surely have been listed. More importantly, it might then have been fully renovated in ways that captured the original vision but adapted it to changing times. Good intentions don’t excuse mistakes but the ability to put mistakes right is surely just as important. We’re always told not to throw money at problems but social housing is forever financially constrained and sometimes it feels as if more money might just make the difference. I don’t know if the Quarry Hill dream could have been fixed but I’ll respect the dream nonetheless. 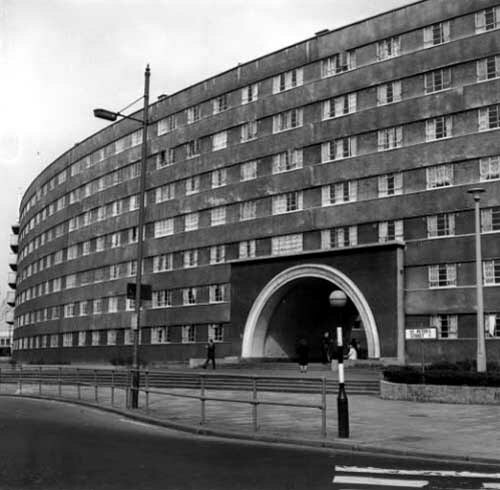 Leodis – the photographic archive of the Leeds Library and Information Service – provides many further images and much supporting detail as well as a very useful webpage dedicated to the history of the estate. Great shame the estate was lost. My great uncle George Robb worked as housing asssitant architect for RAH Livett in the 1930’s. He would have been involved in latter stages of Quarry Hill, but also in some of the more traditional housing. He also designed Shaftesbury House – not the Green House in Beeston. Early 1970’s I recall going to my friends grandfather’s flat, with her mother. Grandad was in hospital, the flat was ransacked. If this is community.. well all I can say is ‘ROSE COLOURED GLASSES’. I remember feeling terrified by the teenagers who were up on the parapets throwing rubbish at us. He was terrified at the thought of going back to the flat.Thankfully he was rehoused in nearby Burmantofts. They couldn’t have demolished them quick enough in my estimation. The vulnerable elderly trapped like caged animals at the mercy of lawless teenagers. The end was far from the idealistic vision. Thanks for taking the time to comment. I try to give a balanced view but will always respect the experience of people who lived on the estates and know them far better than me. I used to love the imposing appearance of Quarry Hill. Its iconic looks garnered national fame after being used as the setting for the Diana Dors sit-com ‘Queenie’s Castle’. Some of the episodes are on YouTube if you haven’t already seen them. I am currently reading the Peter May novel ‘Runaway’. It made me look up Quarry Hills, as the novel touches on the conditions of the flats in 1965. But the more I read about the history of Quarry HIlls, and the comments people have left here about their experiences, makes me want to find out more about it. This is fascinating. Funnily enough reading Peter Mays novel brought me here as well! Thank you for sending this article on Quarry Hill Flatts. My views haven’t changed , they were an absolutely brilliant idea, maybe a little ahead of their time . Somewhere that I am proud to have known. I’ve read comments from a few sites – it’s really touching to see poeple writing about the end of the war, and just their lives here – it really provides some great insight into what life was like at that time. As a family we lost our home when one of the first flying bombs to reach London was shot down. Except for my father we were evacuated to Seacroft, Leeds. My sister in one home and my mother and small brother billeted with an elderly lady just round the corner. We were then moved to Quarry Hill flats, number 22. I have very vivid memories of my life for the following months till we returned to London at the end of April 45. I could write a book of my experience of living in Quarry Hill, life was hard and bleak but it was a part of my childhood experience and still is part of me. 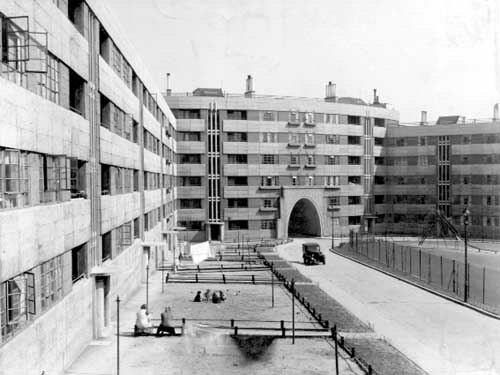 My sister and her husband moved into Oastler House, Quarry Hill Flats in 1940 after being married.They lived there until 1954 when they moved out to new Council Housing in Seacroft. I used to stay with them at weekends. I loved the flats. They had just about everything one could want. They were so close and yet separate from the city centre. The market was a place that we visited every week, l loved the pies and peas. The Fish shop on site sold some delicious fish an chips.To me the waste disposal system was unique, I don’t recollect any problems with it as long as one followed the instructions for use. I never saw them as an eyesore, I loved them but I feel the allocation of tenants might have also heralded their demise.